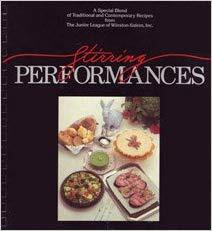 The Junior League of Winston-Salem is proud to announce the limited edition release of the ever popular Stirring Performances Cookbook, which was originally released in 1988. This Winston-Salem favorite, with over 35,000 copies sold to date, features the same outstanding recipes in a new perfect-bound book. Recipes are fresh and current and continue to be favorites of local Triad cooks. Kara Helms, JLWS Past President states “We’re very excited about the return of this cookbook and especially proud of its versatility, evidenced by its appeal to both the novice in the kitchen as well as accomplished cooks. This unique cookbook embraces both the traditional and contemporary cultures found in Winston-Salem”. To purchase a copy, contact us.